Snapdocs automates notary searches, shares loan documents and enables electronic and mobile communication with consumers and everyone involved in a closing. It also provides business performance data analysis and maintains an audit trail of every interaction that occurs during a closing. About 1,300 companies currently use the platform, which includes an agent portal and white-label branding. Now that the implementation deadline for the Consumer Financial Protection Bureau’s (CFPB) Know Before You Owe rule has come and gone, regulatory compliance is a top concern for all real estate and mortgage industry professionals. Snapdocs, provider of an automated loan closing platform, says it can help alleviate some of that pressure for everyone at the closing table, as well as improve the homebuying experience for consumers. The company’s suite of tools automates notary searches, shares loan documents and enables electronic and mobile communication with consumers and everyone involved in a closing, provides business performance data analysis and maintains an audit trail of every interaction that occurs during a closing. The San Francisco-based company is the brainchild of Aaron King, who has worked in the mortgage industry since he was in high school and created NotaryLink, a database of signing agents, notaries and attorneys. “I poked around the mortgage space to see what had been developed, and I was shocked that there wasn’t much besides a few startups trying to get off the ground and gain traction, but they were using incredibly outdated platforms,” King said. After working on the coding for Snapdocs for a year, King applied to Y Combinator for help in building the company. Y Combinator provides seed money, advice and connections to startups in exchange for 7 percent equity in the company. Startups in the program move to Silicon Valley for three months, and Y Combinator’s partners whip them into the best possible shape and refine their pitch to investors. Alumni of the program include Dropbox, Airbnb, Reddit and Weebly. After joining the ranks of those companies in January 2014, “Y Combinator really taught us to focus on the things that mattered most to our business,” King said. “We were able to get the technology built and in front of as many people as possible, and soon we were growing at a rate of 20 percent per month” — and Snapdocs now processes about 20,000 loans per month. The backbone of Snapdocs’ platform is its secure online database of more than 60,000 notaries in every state. Notary profiles include basic information like the notary’s name, bio and photo, but also include helpful information such as their commission certificate, background check results, continuing education credits, insurance policies and whether they speak a foreign language. All Snapdocs users are asked to review their experience with each notary. All users of the database — consumers as well as real estate agents, title companies, lenders and others — are asked to review their experience with each notary. 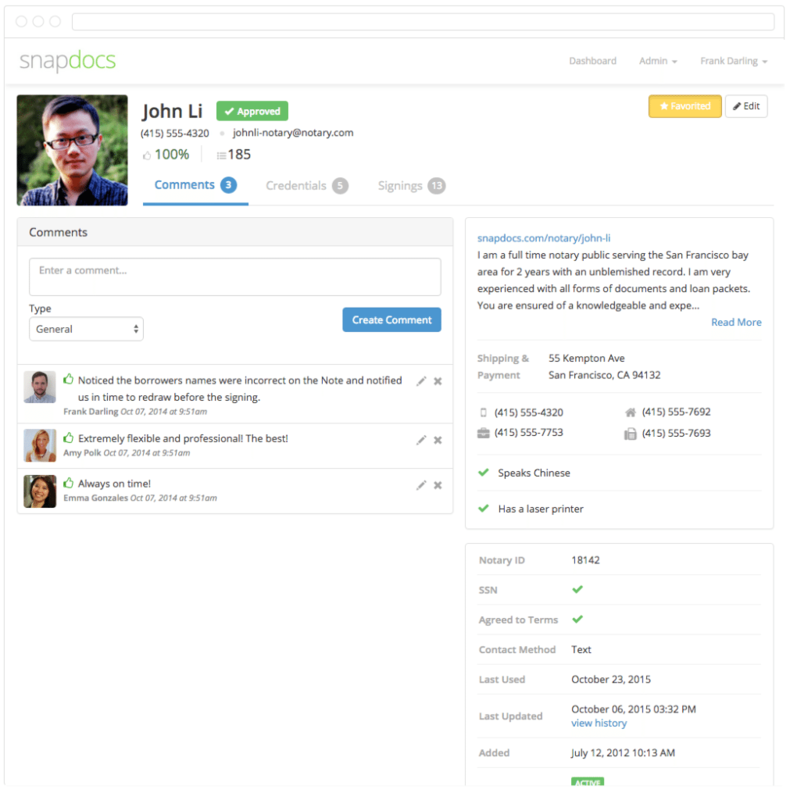 Snapdocs curates the database by using an algorithm that ranks notaries according to quality and user reviews. A built-in query tool scrubs the database of multiple entries, blacklisted notaries or notaries who farm work out to other people. Snapdocs’ tools inform everyone involved in a closing of every event along the way via email or text message, and offers secure document transfer. The company recently launched a new portal for real estate agents so that “now, instead of being an observer to the loan file, agents and brokers can actually participate in the process,” King said. A white-label branding option gives users the ability to use the platform under the umbrella of their own company brand, treating Snapdocs as an “invisible” technology and security layer. Email notifications may also be branded. User pricing is pay-as-you-go, with no long-term contracts and no per-user fees. Pricing for different combinations of these features ranges from $10 to $35 per signing. Notaries can sign up for a profile for free, and lenders, title companies, escrow companies, real estate agents and brokers can also invite notaries with whom they have worked in the past to use the service. “We don’t charge notaries anything — primarily because if we don’t have a deep, wide database, we can’t provide as much value as we want,” King said. Instead, Snapdocs has invested in creating tools for notaries to help them manage their transactions and business records, including the ability to add signing appointments to their calendars with one click, calculate mileage to and from signings and track payments. “These benefits make notaries more active on the website,” King explained. These tools can not only improve the homebuying experience for consumers by making the process more transparent and accessible — the goal of Know Before You Owe in the first place — but they can also give real estate and mortgage companies the ability to manage consumer complaints, King said. 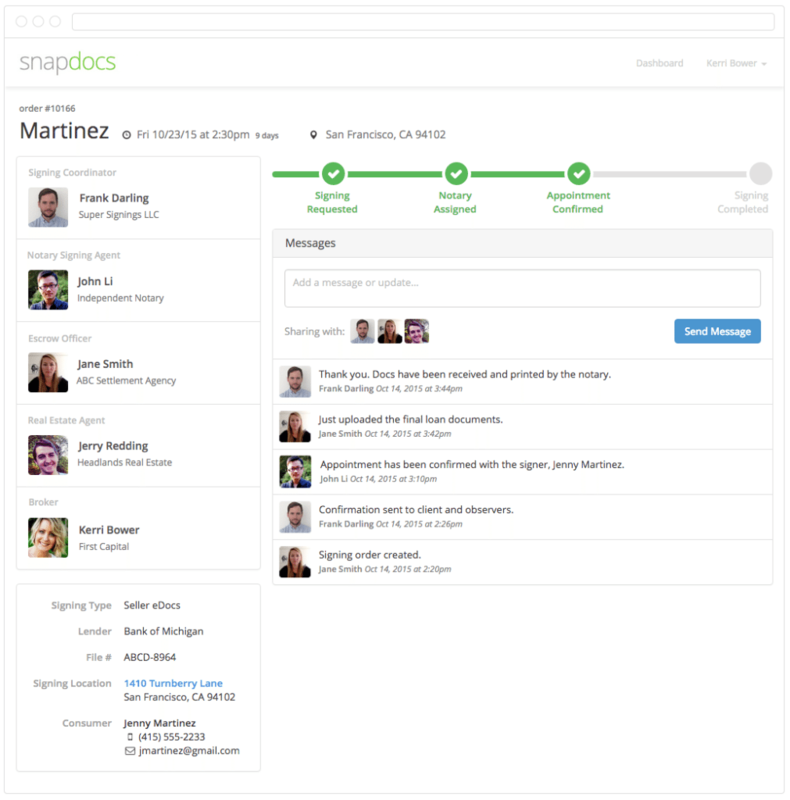 Perhaps the biggest compliance advantage, though, is the audit trail Snapdocs provides. This could save companies thousands of hours and dollars they would normally have to spend on cumbersome regulator requests for documentation and evidence. About 1,300 companies currently use the platform, King said. Could electronic John Hancock be key to TRID compliance?